🤱 Breastfeeding can help your baby’s body fight infections and reduce health risks like asthma, ear infections, SIDS and obesity in children and studies show nursing moms may lower their chances of developing breast and ovarian cancer. Several recent studies, one in Pediatrics in 2015 and one in the August 2017 issue of the Journal of the American Dental Association, found that babies who were exclusively breastfed for the first 6 months were less likely to have teeth alignment issues such as open bites, crossbites, and overbites, than those exclusively breastfed for shorter lengths of time or not at all. Another benefit of exclusive breastfeeding, Dr. Sahota says, is a reduced risk of baby bottle tooth decay, the frequent, prolonged exposure of the baby’s teeth to drinks that contain sugar. This type of tooth decay often occurs when a baby is put to bed with a bottle – even ones containing formula, milk or fruit juice. (Water is fine because the teeth won’t be bathed in sugary liquids for a prolonged time.) It most often occurs in the upper front teeth, but other teeth may also be affected. It’s one of the most common questions nursing mothers ask: Can breastfeeding cause cavities? Yes, it can. Although natural, breast milk, just like formula, contains sugar. That is why breastfed or bottle fed, it’s important to care for your baby’s teeth from the start. A few days after birth, begin wiping your baby’s gums with a clean, moist gauze pad or washcloth every day. Then, brush her teeth twice a day as soon as that first tooth emerges. Use fluoride toothpaste in an amount no more than a smear or the size of a grain of rice. Another helpful resource for nursing moms is the U.S National Library of Medicine’s Drugs and Lactation Database (LactMed). Simply search for any medication and get information about how it affects your supply, your baby and if there’s an alternative available. Talk to your doctor about what you find. 👶 If you think your baby’s toothless smile is cute, just wait until their first few teeth make an appearance! A baby’s 20 primary teeth are already present in the jaws at birth and typically begin to appear when a baby is between 6 months and 1 year. Most children have a full set of 20 primary teeth by the time they are 3. 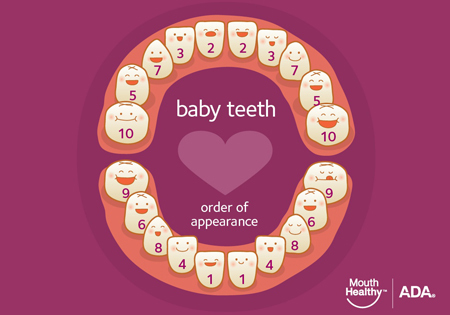 Check out this baby teeth eruption chart to see the order in which teeth break through and at what ages you can expect specific teeth to appear. Every child is different, but usually, the first teeth to come in are located in the top and bottom front of their mouth. When teeth first come in, some babies may have sore or tender gums. Gently rubbing your child’s gums with a clean finger, a small, cool spoon or a wet gauze pad can be soothing. You can also give the baby a clean teething ring to chew on. If your child is still cranky and in pain, consult your dentist or physician. Baby teeth are very important to your child’s health and development. They help him or her chew, speak and smile. They also hold space in the jaws for permanent teeth that are growing under the gums. When a baby tooth is lost too early, the permanent teeth can drift into the empty space and make it difficult for other adult teeth to find a room when they come in. This can make teeth crooked or crowded. That’s why starting infants off with good oral care can help protect their teeth for decades to come. After the first tooth comes in and no later than the first birthday. A dental visit at an early age is a “well-baby checkup” for the teeth. Besides checking for cavities and other problems, the dentist can show you how to clean the child’s teeth properly and how to handle habits like thumb sucking. Learn more about how to prepare for this visit. For children younger than 3 years, start brushing their teeth as soon as they begin to come into the mouth by using fluoride toothpaste in an amount no more than a smear or the size of a grain of rice. Brush teeth thoroughly twice per day (morning and night) or as directed by a dentist or physician. 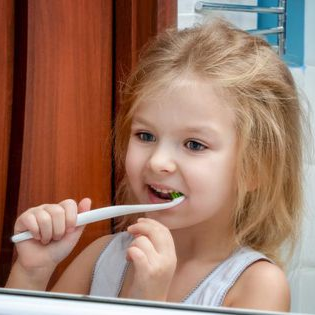 Supervise children’s brushing to ensure that they use the appropriate amount of toothpaste. That’s because new research has shown interdental cleaning before brushing is the best way to clean our teeth effectively. The study found that flossing loosens bacteria and food debris from between the teeth, which allows brushing to be much more successful at removing plaque. Those that interdentally cleaned before brushing were left with a much cleaner mouth than those who did it afterward. Dr. Nigel Carter OBE, Chief Executive of the Oral Health Foundation, believes the findings of the study illustrate why it is so important to make interdental cleaning part of our daily routine. Dr. Carter says: “While brushing twice a day with fluoride toothpaste is absolutely essential for a good oral health routine, this study shows that interdental cleaning also has a big part to play when it comes to keeping our teeth and gums healthy. 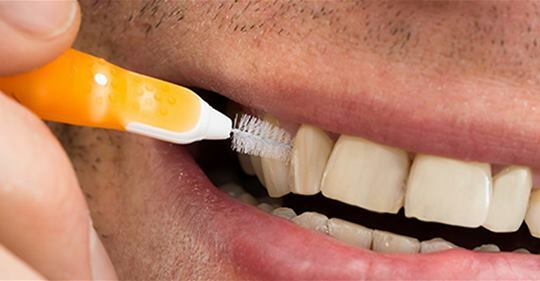 “Brushing alone only cleans three of the five surfaces of our teeth, so cleaning between them before we pick up our toothbrush is hugely beneficial. It helps to prevent gum disease by removing plaque from areas the toothbrush alone cannot reach. “It is a myth that having a good oral health routine begins and ends with brushing our teeth twice a day. This is simply not true. The charity is keen to highlight the importance of a healthy mouth following a number of recent studies linking poor oral health to heart disease, diabetes, dementia, and even erectile dysfunction. Hold the interdental brush between your thumb and forefinger. Gently place the brush through the gap between your teeth – don’t force the brush through the gap. Brush in and out of each space between your teeth. The research, published in the Journal of Periodontology, also found that cleaning interdentally before brushing is better for our teeth because more fluoride is likely to remain in your mouth afterward. “Fluoride is a natural mineral that protects teeth against tooth decay and reduces the amount of acid that the bacteria on teeth produce,” adds Dr. Carter. How do you know if you are using too much toothpaste? If your body is covered in toothpaste head-to-toe, you are probably using too much toothpaste. You also may have horrible aim. However, even if you are keeping the toothpaste confined to your mouth, you still may be using too much toothpaste. Using too much toothpaste could be a problem, especially if you are less than 6 years old. The Centers for Disease Control and Prevention (CDC) recommends that anyone less 2 years old not use fluoride toothpaste. 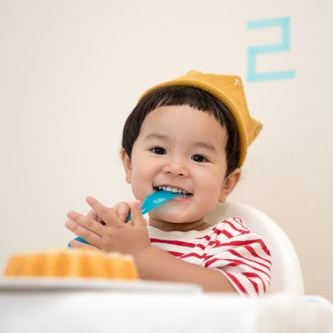 If you’re between 2 and 3 years old, the American Academy of Pediatrics (AAP), American Academy of Pediatric Dentistry (AAPD), and American Dental Association (ADA) recommendation is brushing twice a day, using a rice grain-sized amount of toothpaste each time. If you are between 3 and 6 years old, you should continue to brush your teeth twice daily with no more than a pea-sized (that’s “pea” with an “a”) amount of toothpaste, which is approximately 0.25 g, on each occasion. Why the limitations? Although fluoride can help prevent tooth decay, swallowing too much while your teeth are still forming can mess up the enamel on your teeth. This condition, deemed dental fluorosis, can result in white spots or lines. In case you are wondering, such a permanent bedazzled look is not a great one for you teeth. In more severe cases, pits can develop on your teeth. The pea-sized recommendation only goes to age 6 because by then presumably you have enough control to not regularly swallow your toothpaste while brushing. Presumably. By the time you reach 8 years old, your teeth have probably already developed to the point where dental fluorosis is no longer a real concern. This doesn’t necessarily mean that when you get beyond 8 years old that you should start stuffing your mouth with toothpaste. A pea-sized amount should suffice for teens and adults as well. If you are foaming at the mouth while brushing, you are most likely either a werewolf or using too much toothpaste. A study published in the Morbidity and Mortality Weekly Report (MMWR)showed that a significant percentage of kids may not be following these recommendations. For the study, a team from the CDC (Gina Thornton-Evans, DDS, Michele L. Junger, DDS, Mei Lin, MD, Liang Wei, MS, Lorena Espinoza, DDS) and the D.B. Consulting Group, Inc. (Eugenio Beltran-Aguilar, DMD, DrPH) analyzed data on 5,157 children and adolescents who were 3 to 15 years old and whose parents or caregivers completed the National Health and Nutrition Examination Survey (NHANES) from 2013 to 2016. The NHANES included questions on the children’s and adolescents’ toothbrushing habits. Or should it be teeth brushing habits? The study found that when it came to following the CDC’s toothbrushing recommendations, many of the kids were not all right. Some kids jumped the gums, with 8.9% of white kids, 10.8% of black kids, and 7.7% of Mexican-American kids beginning to use toothpaste before reaching one year in age. Others started late, with 21.4% of white kids, 17.3% of black kids, and 31.2% of Mexican-American kids brushing off using toothpaste until after reaching 3 years of age. A size-able percentage of those between 3 and 6 years old were using too much toothpaste with a reported 12.4% using a smear, 49.2% a pea-sized amount, 20.6% a half load, and 17.8% a full load on their brushes each time. That’s over 38% using too mucha, much, mucha toothpaste while going brusha, brusha, brusha. So add toothpaste to the growing list of things that many Americans are using in excess. Don’t follow those commercials that show a full load of toothpaste on a toothbrush. Instead when you go to the bathroom, beside thinking pee, you may want to think pea. Just make sure you don’t mix up the two. Are you planning to visit us for a wisdom tooth extraction soon? Wisdom teeth removal is one of the most common dental surgeries. It can take up to 2 weeks to recover fully after wisdom teeth removal. Looking after the wound properly can help a person to heal as quickly as possible. Wisdom teeth are large teeth that grow at the very back of the mouth. Most people’s wisdom teeth come through between the ages of 17 and 25. Some people may not have any wisdom teeth come through at all. Sometimes, there is not enough room in the mouth for wisdom teeth to move into the right position. They might break through the gums at an angle or only come through partially. When this occurs, they are called impacted wisdom teeth, and they can cause problems, such as pain or an infection. The length of time it takes to remove a wisdom tooth depends on the tooth and the difficulty of the surgery. Recovery from wisdom teeth removal usually takes a couple of weeks. Some people might need stitches to help close the wound. The dental surgeon will usually remove the stitches after about 1 week. Sometimes, the surgery causes bruising, swelling, and pain, which will also require time to heal. Recovery from wisdom tooth surgery will be gradual, but people should see some improvement every day. First 24 hours: Blood clots will form. 2 to 3 days: Swelling of the mouth and cheeks should improve. 7 days: A dentist can remove any stitches that remain. 7 to 10 days: Jaw stiffness and soreness should go away. 2 weeks: Any mild bruising on the face should heal. Recovery time will be different for everyone. If blood clots become dislodged from the wound, or the wound becomes infected, recovery may take longer. It is a good idea to gently rinse the mouth with antiseptic mouth rinse after 24 hours. What can you do immediately after surgery? Pain relief medication may help to relieve discomfort after wisdom teeth removal. People should take the advice of their dentist or surgeon on how to aid recovery. They should give clear information on any medication to take and what to do to encourage healing. Advice might include biting on a gauze pad in the extraction area for 30 minutes. A dentist or surgeon may also suggest using an ice pack for the first few hours after surgery. Holding an ice pack to the outside of the face over the area of the extraction site for 15 minutes on and 15 minutes off will help reduce discomfort and swelling. A range of cold packs is available for purchase online. People will not be able to drive for 48 hours if they have been in the hospital for surgery and had a general anesthetic. If possible, it is a good idea to take 1 or 2 days off work or school after surgery. People can take pain relief medication, such as ibuprofen, to help with pain and discomfort after wisdom tooth surgery. Ibuprofen is available for purchase over the counter or online. It is essential to keep the wound clean while it is healing. Because people still need to eat and drink, food can easily get stuck in the area where the tooth was removed. This can make keeping the wound area clean a bit challenging. using an antiseptic mouth rinse to prevent infection. 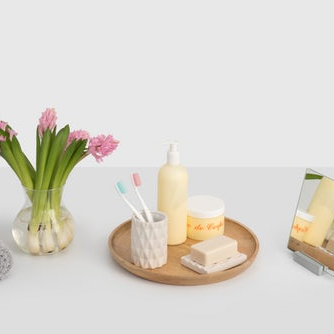 A range of products is available for purchase online. As well as pain, some people will feel tired after having their wisdom teeth out and might choose to avoid exercise for a few days after the surgery. What foods can I eat after wisdom tooth extraction?It can be difficult to eat after having a wisdom teeth extracted. Thankfully, there are some foods that are easy to eat that may help the recovery process. Learn more here. For the first few days after surgery, avoid foods that need chewing, such as sticky candy or chewing gum as these may get stuck and can cause pain and damage to the healing wounds. Also avoid hard, crunchy food, such as chips, pretzels, nuts, and seeds, as well as hot or spicy foods. 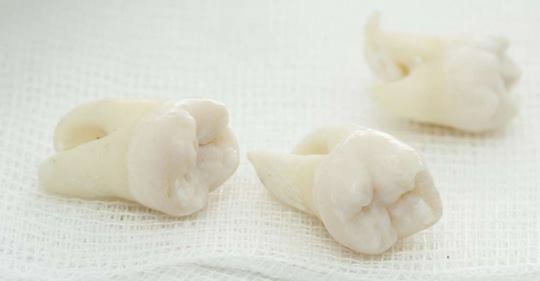 If one or two wisdom teeth have been removed from the same side of the mouth, it may be possible to chew on the opposite side of the mouth after 24 hours. Why are the wisdom teeth so problematic? As wisdom teeth come through in adulthood, the other teeth in the mouth have already settled into place. There often is not enough room in the mouth for the arrival of four large teeth. If a tooth only comes part way through the gum, it is easy for food to get trapped between the tooth and gum. It can also be more difficult to keep these teeth clean, which can lead to infection or tooth decay. However, wisdom teeth can also cause problems even if they come through the gum entirely. If they grow at an angle, they might rub against the inside of the mouth or the gums. They may cause pain by pushing against other teeth. Visiting the dentist regularly as an adolescent and in early adulthood means that the dentist can keep an eye on how the wisdom teeth are developing and should be able to identify whether there will be any problems. With proper aftercare, recovery usually takes around 2 weeks. Sometimes, a person may develop an infection and will require antibiotics. Symptoms of an infection include pain, swelling, yellow or white pus around the wound, and a high temperature. There is a small risk of developing a condition called dry socket. This can happen if a blood clot does not form or gets knocked away from the wound. Dry socket causes an intense, throbbing pain. A dentist will usually need to cover the wound with a dressing. Complications are unlikely after wisdom tooth surgery with proper aftercare. If someone has severe pain, a lot of bleeding, a fever, or any other unexpected symptoms, they may wish to see a doctor or dentist. http://woodviewos.com/wp-content/uploads/2017/03/woodview_oral_surgery_logo-300x97.png 0 0 StarlightSocialDC http://woodviewos.com/wp-content/uploads/2017/03/woodview_oral_surgery_logo-300x97.png StarlightSocialDC2018-06-10 23:17:272019-02-18 23:22:04How long does it take to recover from a wisdom tooth extraction? According to the Center for Disease Control and Prevention’s ( CDC ) Oral Health report, over 90% of Americans have had at least one cavity,and one in four has untreated tooth decay. Meanwhile, around half of all adults above the age of 30 have gum disease. http://woodviewos.com/wp-content/uploads/2017/03/woodview_oral_surgery_logo-300x97.png 0 0 StarlightSocialDC http://woodviewos.com/wp-content/uploads/2017/03/woodview_oral_surgery_logo-300x97.png StarlightSocialDC2018-06-06 10:04:252019-02-02 10:07:55Is Water Flossing the Perfect Tool for Better Oral Health?